One of the most famous Talmudic dictums is that of Hillel who said, “If I am not for myself, who will be? If I am only for myself, what am I? And if not now, when?” We’ll leave aside the first parts for now, the ones which discuss what decisions a person should make in terms of his efforts to achieve things, and focus on the last part: when they should be done. Hillel seems to say that when an action is beneficial, it should not be delayed. Rather, it should be done right away. However, Hillel doesn’t really explain what’s wrong if you do it in a day or so. There’s another famous expression that says, “Strike while the iron is hot.” This one is a bit clearer. A blacksmith needs to shape iron in order to turn it into useful items. To do this, he heats it until it glows, when it becomes softer and malleable. Then he uses his tools like his hammer to pound the metal against the sturdy anvil to shape it the way he wants. OK, so I now know everything I need to know to make horseshoes (by the way, wear gloves and an apron – trust me on this) but why is it such an important phrase? I’m not a blacksmith so what’s in that for me? Well, let’s say you don’t strike while the iron is hot. You wait until it cools. Not only does nothing happen, but you might hurt yourself. And, if you ever did get the iron to bend, it would be a lot harder. Want another example? Let’s say you’ve made a delicious cholent. Shabbos morning the house is filled with the aroma of all its piping hot goodness. Everyone enjoys it, and now you’ve got this pot full of cholent remnants that needs to be cleaned. You can’t wash it now as you normally would. If you wait until after Shabbos, you will need a jackhammer to get the crust off the pot. Maybe you just ought to buy a new one. But wait! If you strike while the iron is hot, or in this case, you soak before the cholent is hard, it will be much easier to wipe away later. Did juice spill on the counter? Or better yet, Slurpee? Wipe it right away and it will come off. Wait too long and that stuff will get sticky and hang on for dear life. Depending on what spilled, you may end up with not just a mess, but a foul odor that lingers. It all could have been avoided if you’d only followed Hillel’s advice and acted quickly, in the moment. In life, we often make errors; errors in judgment, errors in failing to understand the gravity of the situation, and simply poor choices. What will separate the men from the boys (or women from girls, if you prefer) is how fast you act to recover from those mistakes. If you immediately realize that you were wrong and try to rectify the situation, either by apologizing to the person you hurt or by doing Teshuva and regretting your sin, it will be much easier to wipe it away. On the other hand, if you refuse to admit you were wrong, that stink will cling to you and be much harder to get away from later on. Once you’ve become accustomed to a habit, it’s hard to break it. Striking while the iron is hot means you immediately recognize the folly of your ways and declare that this is not who you are or what you intend to do. R’ Shlomo Zalman Auerbach famously said at his wife’s funeral that he did not have to ask her for forgiveness (as it is customary for spouses to do) because he didn’t do anything to hurt her. I’ve heard it suggested that this wasn’t meant that never in his life did he do anything to hurt her, but that he never let the hurt remain. He apologized and appeased his wife immediately and this is why he didn’t have to ask her forgiveness later on. Not to diminish the greatness of this sage, but it is not only a very plausible explanation, but one that we can all try to aspire to. We may not be able to avoid making mistakes, but we can avoid holding onto them. If we act now, when the heat of the moment hasn’t fully diminished, we will be able to clean up the mess much more easily. 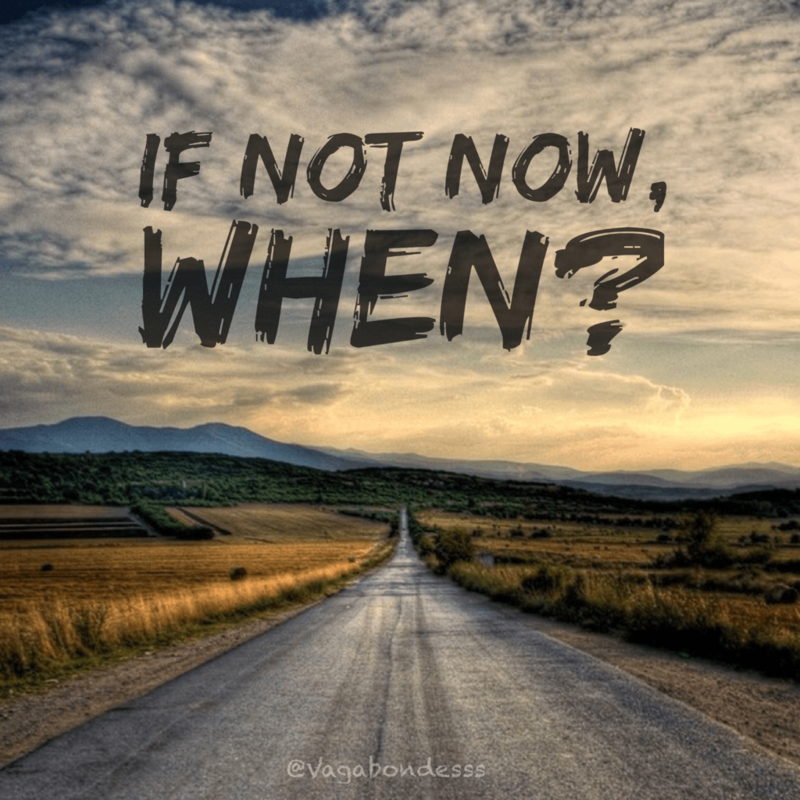 So when Hillel asked, “If not now, when,” what he was saying is that there will never be as favorable a time to take action as right now. The clean-up will be very different in the future, so why would you ever put off until tomorrow what you can do today? You might even ask, “If not now, how?” How much harder will it be to fix this later as opposed to now? And then you will realize that there’s no one else who can do this for you but you, and there’s no time like the present – so get to it!